Nov. 1, 2013 9:00 a.m. The Wetaskiwin and District Chamber of Commerce can proudly declare they WOWED a sold out crowd of 200 on October 23rd at the annual Business Awards GALA. The Chamber Business Awards were created to recognize local businesses that excel at their core function and contribute significantly to the economic and social well-being of the community. Like every competition, a winner has to be declared but at the Awards GALA, there were no losers. 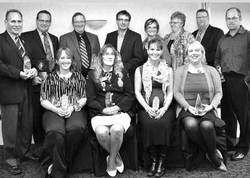 The entire evening exemplified pride in the local business community of Wetaskiwin with eight Business Awards and three special recognition awards being handed out. Upon arrival at the banquet room of the Wayside Inn, a sold-out crowd of 200 supporters were greeted and escorted to pre-assigned tables by the Hobbema Cadets. The tastefully decorated room provided the ambience and professionalism in honor of the businesses and individuals who provide excellent customer service and make Wetaskiwin the #1 choice as a location for doing business. The evening truly represented what it is like to have a community get behind a community. M.C. John Chwyl (fashion celebrity on Global television) kept the program moving on schedule allowing appropriate time for the audience to witness laughter, humbleness and a great deal of emotion accompanying the presentation of the awards. As the evening progressed, it became more and more evident that the Awards were not a competition but more of a sharing of pride among the nominees. Judi Best, Executive Director of the Wetaskiwin and District Chamber of Commerce, stated, “All of the 2013 nominees should be proud of their nomination. They represent the superstars of Wetaskiwin business. Wetaskiwin is full of Opportunity with a Wealth of Experience and Diversity (WOWED) and it was our turn to serve the stars of business”. Judi Best left the event the evening of October 23rd and on October 24th and began planning the Chamber WOWED Awards Gala 2014. “Taking suggestions from our fabulous MC John Chwyl and others, we are already looking at next year’s business awards GALA and how we can improve it. The Awards GALA is an important evening in our community because it showcases the variety and quality of businesses operating in Wetaskiwin and their commitment to providing superior customer service.” The Chamber received seventy nominations but strongly feels there are many more deserving businesses that should be nominated. The Chamber is pleased to work with Business Awards GALA Awards sponsors, ATB Financial, CIBC, the Joint Economic Development Initiative (JEDI), Royal Bank, Scotiabank, TD and the Wetaskiwin Credit Union to host this important event. The Chamber offers a special THANK YOU to all who took the time to submit nominations for this year’s Wetaskiwin “WOWED” Business Awards.